The Hindu published the final part of our 4-part series on the Aspirations and Anxieties round of the Lok Surveys on Friday February 27. The article, “Unsafe after sunset”, highlights how respondents answered the question, “What is the latest time that you feel safe returning home alone?” and was written by Milan Vaishnav of the Carnegie Endowment for International Peace and Neelanjan Sircar of CASI. Our data also show that urbanisation is not a panacea for concerns about public safety. Rather, cities must invest in the “right kind” of urbanisation, with the sort of infrastructure seen in the largest cities. These cities have better amenities (such as street lights) and often have buses or even a metro that runs reliably until late at night. This demonstrates the positive secondary effects on the larger social environment when building infrastructure. Categories: Aspirations and Anxieties, Lok Surveys | Tags: Chhattisgarh, Gujarat, Rural/Urban, safety | Permalink. Watch Tuesday’s episode of Charlie Rose on PBS which includes a discussion about the upcoming Indian election with Milan Vaishnav from the Lok Survey project team, Sadanand Dhume, Professor Arvind Panagariya and Jonathan Shainin. The discussion begins at 28:17. You can also watch the video on CharlieRose.com. Categories: Lok Surveys, Pre-election survey | Tags: Dynasty, Economics, Gender, Gujarat, Identity Politics, Lok Sabha Election 2014, Narendra Modi, Religion | Permalink. Check out this chart detailing projected vote shares for the upcoming Lok Sabha election from our Lok 2014 Pre-election Survey. 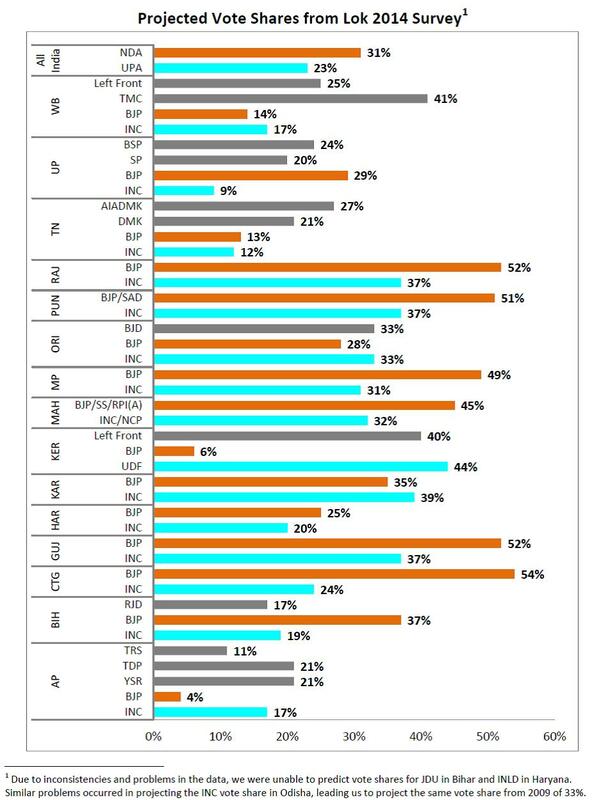 BJP is forecasted to gain over half of the vote shares in four large states- Rajasthan, Punjab (with SAD coalition partner), Chhattisgarh, and Gujarat! These results are based on a survey conducted between October and December of 2013. Read more about the survey project. What do you think about the predictions? Categories: Lok Surveys, Pre-election survey | Tags: BJP, Chhattisgarh, Congress Party, Gujarat, Lok Sabha Election 2014, Punjab, Rajasthan | Permalink.